I scrumped a few windfall quinces at Brogdale the other day! (wouldn't that be a great opening line for a novel?) anyway, came home decided to make quince jelly. What a terriffic success! HOORAY! 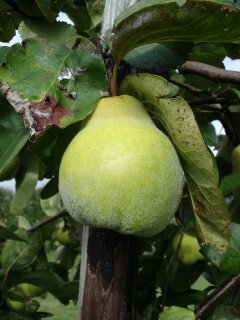 Quinces have a high pectin content, but a low acid content. I blitzed them up in a food processor into chunks, and made jelly. Boil the quinces in the water with the added lemon juice (or citric acid) slowly for about an hour. Drain this through a muslin and allow the juice to drip out for about an hour. Do not squeeze the muslin, you do not want it to go cloudy. Put the quince pieces back in the saucepan, add another pint of water and boil for another 20 minutes. Drip through the muslin as before. For each pint of quince juice you produce, add 1lb of sugar. Return the juice and sugar to a clean pan and boil rapidly for 10 minutes. After this, either use a thermometer and get the temperature up to the jam temperature of over 220F. Every 10 minutes or so, take a spoonfull out of the saucepan on to a cold plate. Put the plate in the freezer for 10 minutes to get an idea if the jelly is set. When it is - b0ttle it! Mine was fantastic - it turns a dark peach colour on cooking. Tastes divine! The National fruit collection at Brogdale have thousands of apple varieties to choose from. Apparently the big supermarkets are interested in finding varieties that they can market in one way or another. Apparently they are interested in small varieties to go in children's lunch boxes (who said children don't like big fruit?) anyway, the above photo is the new big thing at Tesco. This is the exact same truss of fruit that was photographed for their new publicity. 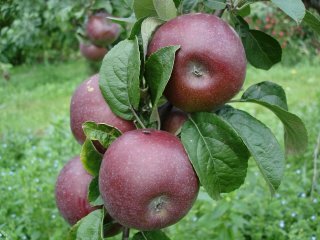 This is a French variety.... called "Pomme Noir". Medlars are a relative of the rose hip. This small brown fruit can only be eaten when it has started to decay and rot. Before this they are way too hard - afterwards they have a very sweet flavour. You can see the resemblance to a rose hip. 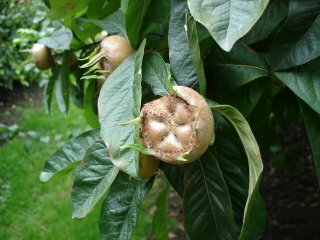 The French call the medlar "un bout de chien" - literally translated - "dog's bottom"..... just take a look! Today I visited the National Fruit collection at Brogdale, near Faversham in Kent. Brogdale also holds the "National collection of nuts"..... and the "National collection of plums". A wonderful 2 hour guided tour of the orchards. 3000 different varieties of apples, 300 different varieties of cherries... I was beguiled by the collection of QUINCE trees (the National collection). All quinces grown at Brogdale are bought and shipped to London exclusively for Fortnum & Mason. I sneaked several windfall quinces.... as we speak, several pints of quince jelly are cooking gently on my stove. More to follow. Pesky critters raise their heads again! My lovely purple sprouting broccoli is about 2 foot tall now, and are growing well. I have to search each one by hand each day looking for small green caterpillars that like to hide in the very small leaves in the middle. They are a bit eaten all over the place - but still looking healthy. I left them for about 4 days without checking - bad mistake! Went out today after some hard rain and they were crawling all over the leaves in broad daylight. One solution - SQUISH! On a recent trip to Northern Norway, I stopped at Nordkapp or North Cape - the Northern most part of mainland Europe. 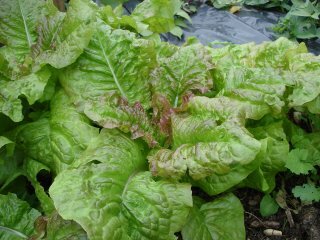 In a gardening shop I bought a packet of lettuce seeds named "Americanische Braun" assuming that they would be fairly hardy. I am really pleased with the results. The leaves are quite soft and tender, fairly elongated leaves like a cos, but much bigger. Light green with a dusting of brown. Delicious to eat, awaits the cold weather for full report. I have pricked out a tray of 3 different varieties of Winter lettuce. Valdor, Winter Density, and a seed packet I bought on the Northern most tip of Norway this Summer - Americanische Braun (American Brown). Will grow them in greenhouse in a growbag and also outside... let's see just how hardy they are. Has anyone tried them? We had some decent rain over the last couple of days, everything is growing well. There seems to be a dry "non-growing" period in about August when everything looks tired and thirsty, then come September everything recovers and starts growing again. 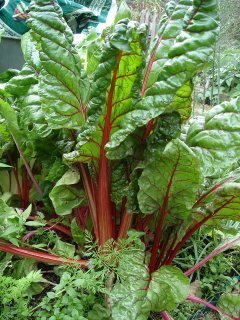 I thinned out my Swiss chard - Bright Lights to about one plant every 4 inches - the plants grow to a decent size then. I have been so pleased with my courgettes this year. I have grown "Defender" for several years having been plagued with mosaic virus for so long. This variety seems to be highly resistant. 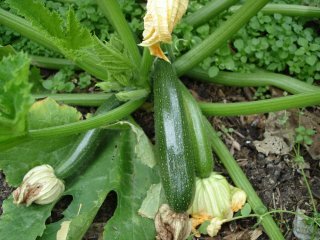 Lots and lots of courgettes this year with my tender loving care and bucketfuls of manure tea - yum! Saw this peeping out of the soil under the black plastic! I will try to keep them growing for as long as I can. I might cover with a fleece to extend the season for a bit - but I am thrilled that my plan worked this year. I thought it was a bit of a gamble. 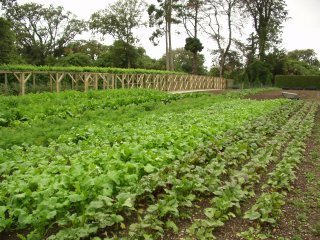 If you ever get the opportunity to visit the walled vegetable garden at Heligan in Cornwall, don't miss it. A couple of years ago I visited in the Autumn and found a discarded dwarf bean plant on the compost heap. The temptation was too great, so a couple of dried pods found their way up to London. An old purple variety called "Royalty" - very prolific. I have been saving seed this week, hanging up the old plants for the large seed pods to dry. I made a large batch of ratatouille today. Peppers, courgettes, aubergines and green beans, thyme - cooked together with tomatoes and onions. Veggie Heaven! I planted a second crop of cucumber seeds at the end of June. In the greenhouse they are already up to the roof and taller than I am. The leaves are enormous! Apparently cucumbers don't really react to the shortening days - they just keep going if it is still warm. Despite a few cooler days it is still up in the 70s and they are all doing fine. 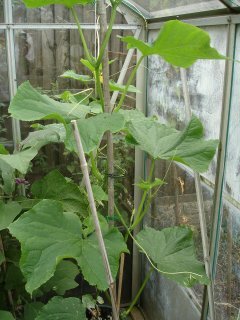 Another early cucumber was completely spent and finished, so I cut it back to about 2feet tall and two leaf joints - it is already up to the roof as well as having a lovely bunch of cucumbers growing. Apparently these take a minimum of 4 months to produce tubers. I planted the rooted cuttings in mid June, after the soil had been well heated up under black plastic. 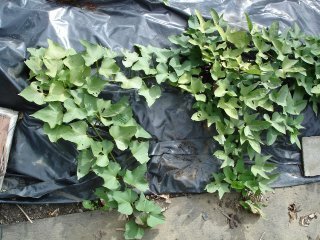 They are trailing all over the ground and slightly resemble ivy. 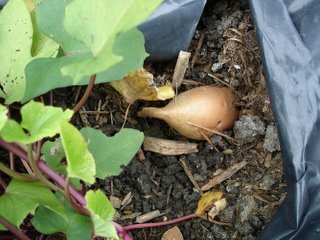 Today whilst watering I noticed a wonderful pink tuber just poking out from the surface of the soil it was about 2 inches thick and 4 inches long - my first sweet potato! Hooray! 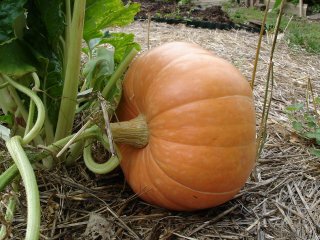 Note the completely different size, colour and shape of my second Dills Atlantic Giant pumpkin. To my mind this is the more attractive. Couldn't resist just one more photograph of my beautiful gardeners delight tomato. Apparently lycopeine levels in tomatoes is highest after 11 days of natural ripening on the vine. Not a lot of people know that - go on - amaze your friends. 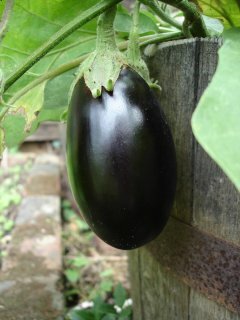 I will be harvesting a fairly successful crop of aubergine "Black Enorma" in the next few days. They suffered in the fierce heat and the ones in the greenhouse were checked by the infestation of red spider mite, however I cut all the growth back and they are making a fantastic recovery. So in the next few weeks, along with home grown courgettes, peppers and tomatoes I will have a pot full of ratatouille - or dead rat - as my Father labelled it in the freezer when I was a puzzled little child. Oh what an interesting childhood. Three cheers for Bob Flowerdew! or "Saint Bob" as he is known... on Gardeners Question Time, his tip for the week was to extend the productive life of cucumbers by cutting down the main stem to about the 2nd leaf joint, and the plant would grow like new again. It did ! The tired old stem was up to the roof of the greenhouse and had just about exhausted itself. Within a few days of cutting right back to about 18" from the pot, new green growth has sprung forth and a new crop of cucumbers is already developing - the longest is already a healty 5". I had also planted a 2nd crop of cucumber seeds at the beginning of July, and these replacement plants are also thriving - except for some nasty case of white mould. Apparently "Bob says" cucumbers do not mind the shortening day length at all, they do however appreciate the warmth, so as long as I can keep them warm they should carry on producing cucumbers. I am also picking my second crop of dwarf French beans. 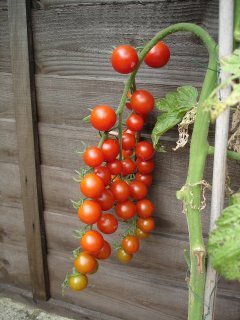 These were also sown at the beginning of July when I got back from holiday - I am picking handfuls every day. Yum! 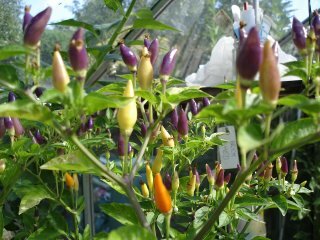 I am growing 2 varieties of chilli for Gardeners World chilli trial this year. "Numex Twilight" seems to be an attractive ornamental variety in a range of colours, might be good as a house plant. The others I have are "Joes Long" which seem to be a bit behind the ones at the Wisley trials field which are up to 12" long! Today I mixed a big bag of lawn mowings with a big bag of steaming fresh horse manure. Water generously, cover with a few layers of carpet, light the blue touch paper and stand well back! 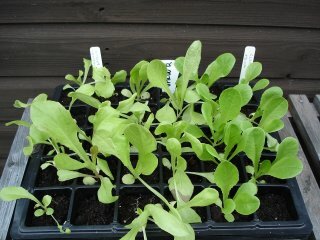 Have some little hardy lettuce seedlings in the greenhouse - I wonder how hardy they are? trying Valdor, and a variety I recently bought in northern Norway called "Americanische Braun" (American Brown?) they seem to be a cos shaped green and red leaf. Awaits.